Submitted by abeebe on Mon, 02/22/2016 - 3:33pm. Originally submitted by Perrdom 07/20/08. Maintained by Box Car 9/5/2011 to 02/22/16. Currently maintained by Abeebe. Added a few new locations, courtesy of Panama. Added new sites and removed closed ones. Thanks to the PigTrip.net website. Added a new location in Sarasota, FL thanks to Bob.Sedona. Deleted Smokehouse BBQ in Louisville, KY...Thanks kusuriurikun. Added a few new sites, thanks to Greg!!! Added some new BBQ joints in VA.
Added Surf BBQ in Rumson, NJ. Added some new locations in New England and deleted a couple that had closed. Added new locations received from Pointer.SD. Added missing locations that are listed on Thrillist as the best BBQ joints. Added Gator's BBQ in Jacksonville, FL from mjnapper. Added new locations and deleted closed locations. Most of the new locations were the result of the PigTrip.net website. submitted 3 in Carson City - the 1st NV locations! submitted Holy Smoke BBQ in Columbus. posted new location that A_user added. submitted Dam Smoker BBQ & Old Crow Real Pit BBQ in Florida. Submitted some 15 locations and suggested a name change. submitted Urban BBQ Sandy Spring, MD location. 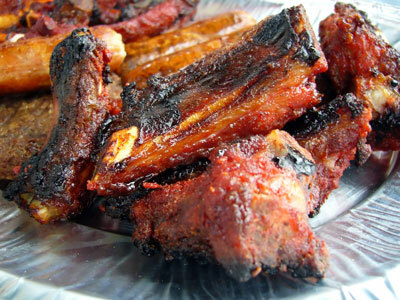 submitted Flaggstead Smokehouse in Farmington, CT.
notified me that Reo's Ribs moved from Aloha OR to Portland OR. submitted 7 locations in WI. submitted 5 new locations in Rochester MN. notified me that "SMOKEY'S BAR-B-QUE GRILL" is out of business. removed a couple of duplicates that got by me. submitted his BBQ Restaurants (NC) file. sent in a delete for the Flint's in Oakland Shattuck Ave location. submitted Big Mouth BBQ in Great Falls Montana. submitted East River Smokehouse in Florida. submitted Joyners Jacks Creek Bar-Be-Que in Jacks Creek TN. submitted Danny Boy's BBQ in Hutchinson, KS. submitted a bunch of Chicago, IL locations & updated the spelling for one of the cities in the file. submitted a location in Cedar Rapids, IA. submitted 2 locations in Charlotte, NC and 1 in Cornelius, NC. submitted The Smokey Pig Restaurant. submitted Big Fatty's on the Square & Fiorella's Jack Stack BBQ. submitted Doby's Smoke House & Randy's Original Roadside BBQ. Perrdom took over lead for this project. There are currently 6 users and 34 guests online.